There are several reasons why I saved “treasures” for the end of this three-part series on stewardship. The first and most basic reason is that, when I first learned the “three T’s of stewardship,” they were given in the order provided in this series (time, talents, and treasures). Secondly, there are those in the church who over-emphasize tithes and offerings. Some preachers will claim that God will not bless you if you do not tithe and give abundant offerings. Of course, they will insinuate that He will bless you only if you give to their ministries. While our faithfulness with our finances is important to God, it is not His primary measure of determining whether He will bless us. (That is primarily decided by His grace, not our generosity.) This exaggerated claim that giving is the pathway to blessing has led me to joke that some churches acknowledge only two sacraments: the altar call and tithing. More importantly, though, we need to realize that God wants us to give ourselves to Him first. Until we surrender our lives and hearts to Him, our financial giving will be meaningless. Our time and talents are most closely related to our innermost being: By nature, we devote our time to those people, principles, and activities we care most about. Human nature drives us to devote our time and talents to the things we care about. It also creates a greater devotion to those things that we devote our time and talents to. Time and talents reveal whether we are devoted to God. When we have devoted our hearts to someone or something, our money will follow. We will devote our expendable income to the things we care about. I will more readily spend my money on music and books than on basketball tickets for a simple reason: I love music and reading, and I hate basketball. If I were forced to buy basketball tickets, I would hate it even more. Unless they were a gift for a basketball fan that I care about; in that case, I would actually be spending the money on a friend or loved one, and the basketball would be secondary. “He also who had received the one talent came forward, saying, ‘Master, I knew you to be a hard man, reaping where you did not sow, and gathering where you scattered no seed, so I was afraid, and I went and hid your talent in the ground. Here you have what is yours.’ But his master answered him, ‘You wicked and slothful servant! You knew that I reap where I have not sown and gather where I scattered no seed? Then you ought to have invested my money with the bankers, and at my coming I should have received what was my own with interest. So take the talent from him and give it to him who has the ten talents. For to everyone who has will more be given, and he will have an abundance. But from the one who has not, even what he has will be taken away. And cast the worthless servant into the outer darkness. In that place there will be weeping and gnashing of teeth’” (Matt. 25:24-30, ESV). Look closely at the servant’s response, because it reflects the attitude of many Christians about money. “Master, I knew you to be a hard man”: He does not recognize God as Someone who loves him or wants to bless him. He sees God merely as a cruel judge. Scripture throughout reminds Christians that we have been entrusted with a stewardship. For example, Paul writes in 1 Corinthians 4:7, “What do you have that you did not receive? If then you received it, why do you boast as if you did not receive it?” All of our finances ultimately belong to God. Some Christians think that if they have given a tithe (ten percent) to the church, then God does not care what they do with the other 90%. Nothing can be further from the truth. While God may allow us some pleasures, we still must use our material resources according to His will. Fiscal irresponsibility (including unnecessary debt, wasteful spending, failure to pay our bills, etc.) are clear signs of spiritual immaturity. So is an unwillingness to provide for your own needs and those of your family through honest employment. This is not to minimize the importance of tithing, though. The church does spiritual work (preaching salvation to sinners, training disciples, encouraging and counseling those in need, etc.) and should not be driven by an emphasis on money. However, we live in a society where money is necessary. One blessing is that few churches force people to pay. We are urged by Scripture to give 10% of our income back to God through the local church. Even in the most money-minded churches I have seen, nobody stood at the door demanding payment as people entered or deprived people of prayer or counsel until they paid their dues. Unfortunately, many Christians trample on this aspect of God’s grace. They assume that they can continually take away from the body of Christ without giving. To see how few Christians tithe, one can visit websites like Generous Giving. According to a page on Statistics and Trends, the major denomination whose members give the highest percentage of their income to the church is the Assemblies of God. Even in this denomination, with a strong teaching in favor of tithing, the average member gives only about 5% of their income to the ministry. Ironically, the same website claims that the AG also has the lowest average income among its members of all major denominations. It seems as though a small handful of Christians actually tithe, and the rest of the church’s members give a token offering. According to Jesus, this is a reflection of what we cherish in our hearts. “[B]ut lay up for yourselves treasures in heaven, where neither moth nor rust destroys and where thieves do not break in and steal. For where your treasure is, there your heart will be also” (Matthew 6:20-21). May we each take a close look at our lives and consider our commitment to God. Let us commit to regular worship with the Body of Christ and to daily prayer for our brothers and sisters, especially our pastors and other spiritual leaders. Let us look at the talents and spiritual gifts God has given us and use our abilities in service to God’s church for His glory. Finally, let us remember to give to the Lord a portion of the material goods He has entrusted to us. In Part I of this series, I shared some thoughts about how we can devote our time to the Lord’s service by giving Him the first fruits of our day. Very closely related to this is the use of our talents to God’s glory. These two are closely intertwined. For most of us, it takes time to exercise our talents. As a writer, I can testify that writing a blog post or a book does not happen instantly. I have to set time apart to use my talents for God’s glory. Many sermons on the topic of talents focus on the parable of the talents in Matthew 25:14-30. (Since it is such a long passage, I will not include it in this post; you may click on the link to read it if you are not familiar with it.) The problem with such sermons is they usually focus on talents in the modern English sense (as skills and abilities) as opposed to the way the term was used in the New Testament: a talent was a large amount of money, not an ability. The parable most directly relates to how people use their money. Of course, the principles apply to all aspects of stewardship, but we can lose sight of that when we spend too much time on a wordplay generated by Greek-to-English translation. One of the great dangers for Christians is to focus too much on whether a skill is a spiritual gift or a natural talent. Some of the “gifts” mentioned above are supernatural spiritual endowments. Prophecy especially comes to mind in this case. Others, though, are abilities that we often see in unbelievers: people who have no relationship with Christ or interest in God can be quite skillful as teachers or leaders, and may have great eagerness to serve others or perform acts of mercy. While such secular skills can be used without any connection to God, they can be enhanced by the Holy Spirit’s work in our lives. We can use any of our abilities in service to God. Most Spirit-filled Christians acknowledge our need to share our spiritual gifts with the Body of Christ. God does not pour out His gifts upon us so that we can show off, brag, or feel like we are holier than other believers. God’s goal is not for us to see who can speak in tongues louder and longer than anybody else. God’s purpose in gifting us is so that we may build others up. Some of our gifts (e.g., speaking in tongues, prophecy, or healing) may be dramatic and supernatural. Others (like leadership, service, and acts of mercy) may seem mundane, even unspiritual, because even a heathen could do them (and, sometimes, we could even get paid pretty well in the marketplace). However, the church needs all of these gifts. Every Christian should want to discover his or her particular gifts and share them with the church. The Body of Christ can grow in numbers and strength through your abilities. Even the natural abilities you had before dedicating your life to Christ are important in this regard. These talents are often needed in the church. As I write this article, I am using talents I discovered as a youth and honed at college, even before I became a believer. God did not miraculously pour out a “spiritual gift of writing and editing” on me one day. However, He molded me to be the person I am, so even those natural abilities come from Him. Since He gave those skills, I have had several opportunities to edit church newsletters and write articles to share the Gospel and build up believers around the world. Yes, the Body of Christ needs writers and editors. It also needs musicians, janitors, bookkeepers, office workers, and others who can share talents they developed long before they came to know Jesus. Probably most of the work in the Kingdom of God relies on such “secular” abilities in one way or another. Even gifts like teaching, preaching, or pastoral ministry often rely on such “secular” skills. A Bible teacher must know how to study, prepare a lesson, and then present it in a clear, cohesive way so that his or her audience understands. A preacher must have some level of public-speaking ability. A pastor is often called upon to use skills related to counseling. We should bring not only our talents before the Lord, but our interests as well. Maybe you do not show any signs of having a gift of evangelism, but you think you would like to help share the Gospel with more people. That interest could be the beginning of something God is trying to stir up within you. He may want you to develop a gift of evangelism through practice and training. I mentioned earlier that time and talents go together. A good way to check your relationship with God is to see how you are using your time and talents. Take a week to log how you spend your time. See how much of your time is used in different spheres. If you are working many more hours than your employer requires, but say you have no time for prayer or fellowship, there is a problem. At the same time, consider your talents, skills, and abilities. How many of them are you using for God’s glory. Are you a talented musician, but are too busy to sing in the choir or play an instrument in the worship band? Whatever your talents and abilities, find ways to use them within the Church and to glorify God. Do people tell you that you are really good at something? Find ways to use it for God’s glory. Are you interested in learning a skill? Work on that and find ways to develop the skill within the church. “And whatever you do, in word or deed, do everything in the name of the Lord Jesus, giving thanks to God the Father through him” (Colossians 3:17). Many people make commitments, at different times, to improve themselves. New Year’s Day brings a new rush of resolutions. Many of us repeat the same resolutions we made the previous year. Many Christians give up something, perhaps a particular comfort food or habit, during the season of Lent, but are no better the following year. Major life transitions may also challenge us to review our priorities and desire to be a better person. Ironically, most of our resolutions and recommitments are self-centered. They focus on how we can make our own lives better or how we can feel better about ourselves. Few people really think about how they can make the world a better place or truly draw closer to God. This is the first of a three-part series about stewardship. As you read each part, I challenge you to take a different approach than you may have in the past. Many of us are trying to find way to improve our physical health. Instead, why not commit to improving the health of the body of Christ? “For just as the body is one and has many members, and all the members of the body, though many, are one body, so it is with Christ. For in one Spirit we were all baptized into one body—Jews or Greeks, slaves or free—and all were made to drink of one Spirit. For the body does not consist of one member but of many” (1 Corinthians 12:12-14, ESV). Paul goes on to describe how each part has its own distinct function. Different parts need to be connected to the body, and each contributes to its overall health. Likewise, every Christian has a blessing to offer to the body of Christ. We each have different spiritual gifts, natural abilities, interests and passions that equip us to bless the church in different ways. In this three-part series, I will encourage you to consider how you can bless God’s Kingdom by giving of your time, talents, and treasures. The Bible often mentions the importance of giving our first fruits to God. This term comes from the Old Testament, where worshipers were expected to bring the first crops they harvested as an offering to the Lord. The term first fruits expanded to include other “firsts”: the firstborn son was consecrated to the Lord; other first blessings were given over to God. Many Christians are quick to think of first fruits in terms of finances. True disciples pay tithes as a priority, even if there are other pressing financial needs or wants. However, first fruits is not merely a reference to money: It is a principle that applies to all aspects of Christian stewardship. Giving to God is always a priority item. We do not worship God as an afterthought or give Him our leftovers: We give Him the best we can offer. The Bible’s first account of sacrificial worship bears this out. When Cain and Abel offered sacrifices, Abel offered the first fruits of his flock, while Cain seems to have haphazardly pulled some of his produce together (see Gen. 4:3-4). God accepted Abel’s sacrifice but not Cain’s. 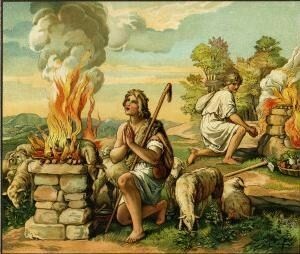 Was it because Abel offered a blood sacrifice and Cain did not? This is a popular explanation, but it is weak. Many explain God’s displeasure with Cain’s offering by citing Hebrews 9:22: “Without the shedding of blood there is no forgiveness of sins.” Yet, there is no indication in Genesis 4 that Cain and Abel were seeking forgiveness at that point. Some fellowship and peace offerings in the Old Testament were vegetables and grain. It seems as though the attitude was what mattered: first fruits represented not only the first, but the best. Abel gave his best, while Cain just gave haphazardly. God wants and deserves our best. He wants worship and fellowship to be a priority. However, many Christians fit corporate worship in when it is convenient. Favorite television shows, hobbies, the children’s weekend sports activities, and other diversions may keep us from church. If we truly love God and are excited about our salvation, we should be eager to give Him our time. Yet, many Christians give the first fruits of their time and energy to the world (their jobs, leisure activities) instead of to God. Some come to church only if nothing else is going on. Our time at church goes beyond singing a few upbeat songs and listening to an inspiring sermon. True fellowship involves looking for ways to be an encouragement to others: “And let us consider how to stir up one another to love and good works, not neglecting to meet together, as is the habit of some, but encouraging one another, and all the more as you see the Day drawing near” (Hebrews 10:24-25). We should seek opportunities to bless others. We should also bless the body of Christ with our prayers. A serious disciple of our Lord will choose to make time for prayer. Prayer comes before television, not when there is nothing to watch. If we decide to pray “when I get around to it,” we will never commune with God. My current goal is to pray the four Daily Offices of prayer indicated in the Book of Common Prayer [morning, noon, evening and compline (before bed)]. I usually succeed in praying three of them (I have to confess, I can get lazy around compline time). Getting those prayer times in is not easy: I have to choose to sit down and pray the morning office before work. I have to turn my eyes from my computer at lunch time to pray the noon office. I have to really force myself to pray the evening office. These do not come easily. It starts with a decision that “This is important.” Sure, I can find a TV show to watch or a website to visit, but if I want to pray, I will make the time. If you are serious about giving God the first fruits of your time, chart your course. How much time will I spend in prayer every day? When will it be? How much of it will be Bible reading, and how much will be prayer? Where will I pray? (This last one is important: You need to find a place where you will not be distracted or interrupted.) Then, based on these decisions, make a commitment to pray. Write it in your planner as an urgent appointment. Eventually, it will become a habit, like eating three meals per day. It is interesting to note that Paul mentions prayer at the end of his description of the full armor of God in Ephesians 6. He says that we should pray “at all times in the Spirit, with all prayer and supplication” (Ephesians 6:18). He urges his readers to pray for him. This should remind us to pray for our brothers and sisters in Christ, especially our spiritual leaders. Your pastor needs your prayers. If your church does not publish a prayer list or notify members about prayer requests, ask you pastor how you can pray for the church. Commit to being a prayer warrior for your church. If the word of God is the sword of the Spirit (Ephesians 6:17), then prayer is our spiritual missile. It is the weapon that can engage in spiritual warfare across great spans of space and time. Prayer for the church and its members is a vital ministry that all believers, regardless of skills, gifts, or spiritual maturity level, can participate in.